The villa is on the popular north coast of the island, situated in a small and exclusive beach front residential estate. It is a 20 minute drive from the International Airport, and just 10 minutes from Bophut and the fascinating ‘Fisherman's Village', where there is a wide choice of restaurants and individual shops. It is also 20 minutes to popular Chaweng, on the island's north east coast, a tourist centre offering numerous restaurants, bars and nightlife. Santiburi Golf and Country Club is 15 minutes away. Beautiful beach and ocean views are to be expected, of course, and the pool and lawn are raised a little, helping to maintain privacy, yet not distracting from the vistas to be enjoyed. There is a poolside sala for al fresco dining for 14, where there is the very latest 6-burner gas barbecue, a sink and a fridge. Evening socialising can be enhanced with music piped to the exterior surround-sound speakers from the iPod dock. There is a bathroom adjacent to the pool area. The main living room is a big, open plan area, with a high vaulted timber ceiling. The dining room has a table for 14. There is a 50 inch home theatre screen, an Apple TV, DVD player, satellite connection to the television, tea and coffee making equipment, and a bar fridge. There is a guest bathroom adjacent to the living area. Through the dining room is a covered outdoor sitting room, which overlooks the pool, lawn and beach. This is fully furnished for comfort with sofas, coffee tables, a daybed and a ceiling fan. There is a fully equipped European style kitchen, with western appliances, such as a dishwasher, combi microwave, 6 burner gas stove and oven. Behind this is a Thai kitchen, where meals can be prepared by the villa staff. There are 7 bedroom suites in this stunning property. The master suite, which is situated at the beach end of the villa, has pool, beach and sea views, while the other six suites have individual furnished patios. Every suite has air conditioning, a ceiling fan, Italian ceramic floor tiles, LED lighting, a desk, small fridge, safe and hair dryer. Each suite comes with its own 40 or 50 inch Smart satellite TV with amplifier, in-ceiling speakers and a DVD player. Five bedrooms have king size beds and two are twin-bedded, but these can be converted to a single king size bed if desired. The large en suite bathrooms all have double vanity units and both indoor and outdoor showers. Two of the bathrooms also have bath tubs. The separate children's wing can sleep 6 children, in full-size bunk beds. This room is as beautifully furnished as the main bedroom suites, and has an adjoining lounge for the 40 inch Smart TV, DVD player, Wii and mini-fridge. There is an indoor shower in the bathroom. Stairs from the rear of the property lead to the first floor, which is shared with the mirror villa next door. Here are located the multi-media room, sauna, shower and the fully equipped fitness centre. Massage salas are found on either side of this floor. The gym includes a cross trainer, an adjustable bench, Bosu and medicines balls, treadmill, upright bicycle, an exercise mat and a Reebok round roller. 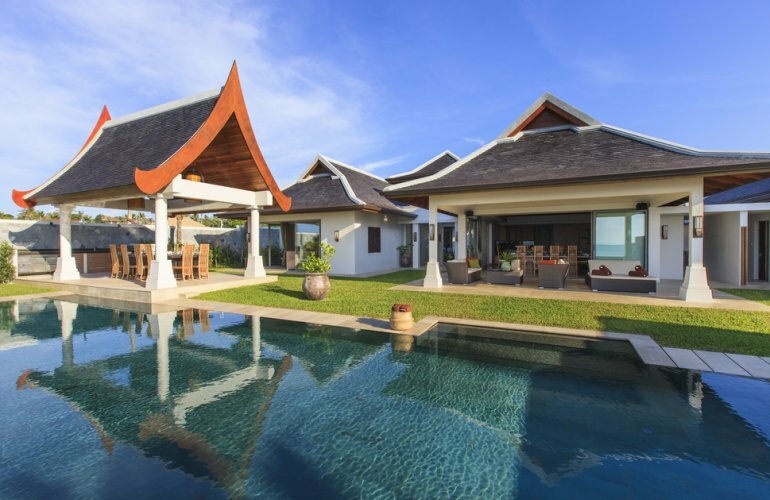 Ideally suited to larger parties of friends or families wishing to share the most idyllic of vacation spots, this stunning villa can also be rented together with the neighbouring ‘mirror' villa for even larger wedding or conference groups.